Pulsar PT3641X chronograph men's watch features a 45mm wide and 11mm thick two tone black ion plated solid stainless steel case with a fixed bezel and a textured push-pull crown with function pushers. Pulsar PT3641X is powered by an accurate Japanese quartz chronograph movement. This stylish watch also features a textured black dial with white accents silver tone luminous skeleton hands and index hour markers along with the chronograph, 12/24-hour time and date display functions, scratch resistant mineral crystal and water resistant to 100 meters. Pulsar PT3641X is equipped with a 22mm wide solid stainless steel bracelet with a fold over safety lock clasp. 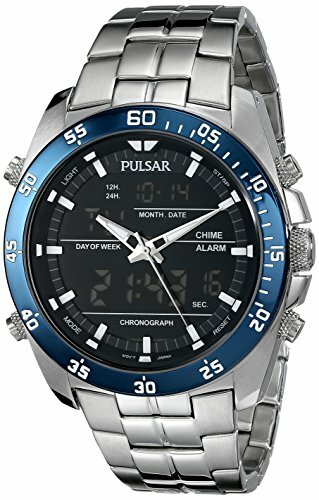 Pulsar PT3641X men's chronograph black dial steel bracelet date watch is brand new and comes in an original Pulsar gift box and is backed by a 3 years limited warranty. 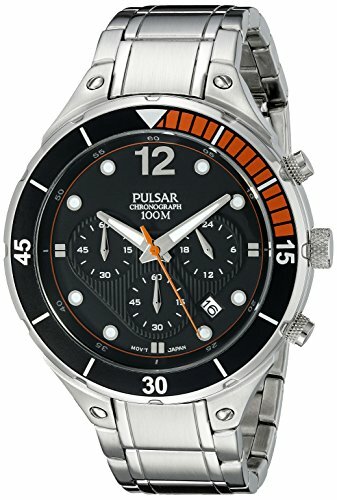 Pulsar PT3635 On The Go chronograph men's watch features a 45mm wide and 13mm thick solid stainless steel case with an orange accented black fixed bezel and a textured push-pull crown with function pushers. Pulsar PT3635 is powered by an accurate Japanese VD53 quartz chronograph movement. This stylish watch also features a textured black dial with white accents silver tone luminous hands and dot hour markers along with the chronograph, 12/24-hour time and date display functions, scratch resistant mineral crystal and water resistant to 100 meters. 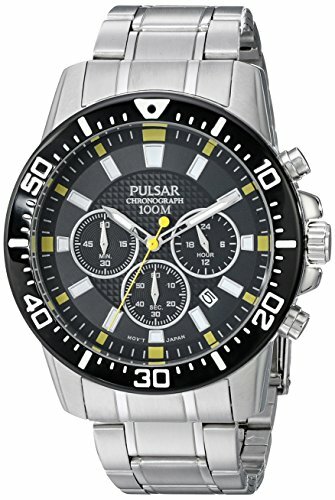 Pulsar PT3635 is equipped with a 20mm wide solid stainless steel bracelet with a fold over push button clasp. 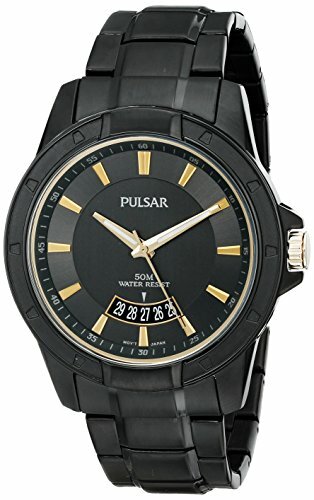 Pulsar PT3635 men's On The Go black dial steel bracelet chronograph watch is brand new and comes in an original Pulsar gift box and is backed by a 3 years limited warranty. Pulsar PT3637 On The Go chronograph men's watch features a 45mm wide and 13mm thick black ion plated solid stainless steel case with a fixed bezel and a textured push-pull crown with function pushers. 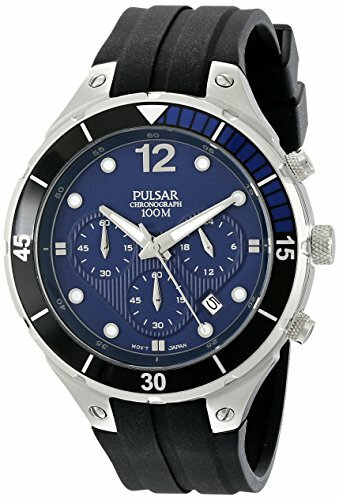 Pulsar PT3637 is powered by an accurate Japanese VD53 quartz chronograph movement. This stylish watch also features a textured black dial with white accents silver tone luminous hands and dot hour markers along with the chronograph, 12/24-hour time and date display functions, scratch resistant mineral crystal and water resistant to 100 meters. 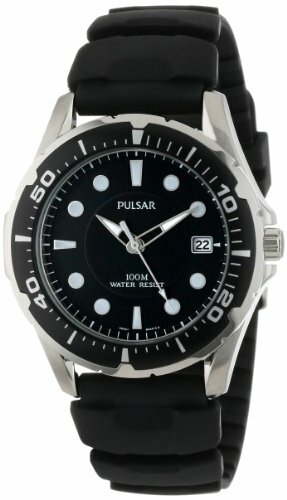 Pulsar PT3637 is equipped with a 20mm wide black ion plated solid stainless steel bracelet with a fold over push button clasp. 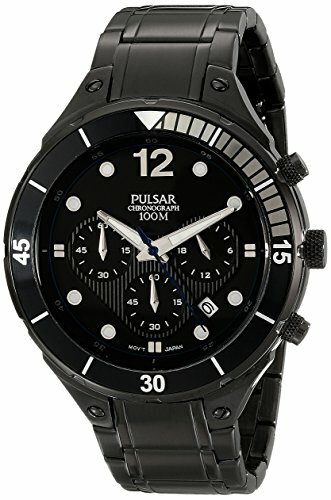 Pulsar PT3637 men's On The Go black dial black IP steel bracelet chronograph watch is brand new and comes in an original Pulsar gift box and is backed by a 3 years limited warranty. WORKING RARE VINTAGE ANALOG DIGITAL DUAL TIME PULSAR WATCH Y651-5060 NEW BATT. Vintage Elegant Classic Pulsar Analog V701-X042 Dress Watch [email protected]@K! RARE Pulsar H022-6000 yellow dial Mens Watch. Rare movement. Want more Pulsar Analog Digital similar ideas? Try to explore these searches: Fruit Plus Supplement, Rugged Ridge Air, and Sync Home Charger.